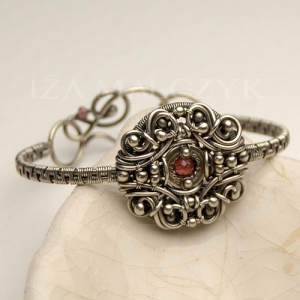 Delicate bangle-bracelet made entirely from scratch in oxidised and polished fine and sterling silver and adorned with AAA grade rhodolite garnet. Impressive medallion which is about 2,5cm / 1 inch in diameter, was set on a wire-wrapped band finished with a hook clasp. The minimal length of the bracelet is 15,5cm which makes it perfect even for a thin wrist. When adding 6cm of extension chain, the bracelet will suit wrists up to 21cm of circumference. Please, let me know about the exact size of your wrist so that I can adjust the shape of the bracelet for you. You will receive it gift-packed.